Soybean aphids have afflicted our national soybean crop for over a decade. This relative newcomer to our fields has impacted crop revenues,1 as well as the environment, and farmers have responded by applying insecticides. There are side effects of insecticides, including insecticide resistance, resurgence of the soybean aphid, and replacement of aphids with other types of pest.2 Thus research has focused on answering the question: when does it make sense to apply insecticide and when should we let natural aphid predators do the work for us? In the case of soybean aphid management in the U.S., farmers are basing insecticide application on the economic and ecological threshold of infestation, using routine monitoring of soybean plants to determine aphid infestation levels relative to that threshold, and applying insecticide on a geographic scale small enough to control the driver (aphids) and monitor ecological outcomes (crop yield). Over three billion bushels of soybeans were grown in the U.S. Midwest in 2011, which provides ample motivation to investigate the thresholds that may affect profit.8 Most ecosystem shifts are not directly correlated to a loss in economic value, but where they are, there is a powerful incentive to invest in research around potential tipping points. Such market-based tipping points may be helpful case studies for evaluating effective, scalable adaptive management strategies in broader socio-ecological systems. 1Wu Z, Schenk-Hamlin D, Zhan W, Ragsdale D, and Heimpel G. 2004. "The soybean aphid in China: a historical review" Annals of the Entomological Society of America 97 (2): 209–218. 2Johnson K, O’Neal M, Ragsdale D, et al. 2009. Probability of cost-effective management of soybean aphid (Hemiptera: Aphididae) in North America. Journal of Economic Entomology, 102(6):2101-2108. 3Ragsdale D, McCornack B, Venette R, et al. 2007. Economic threshold for soybean aphid (Hemiptera: Aphididae). Entomological Society of America 100(4):1258-1267. 4Swinton, Scott. Personal Communication. February 2013. 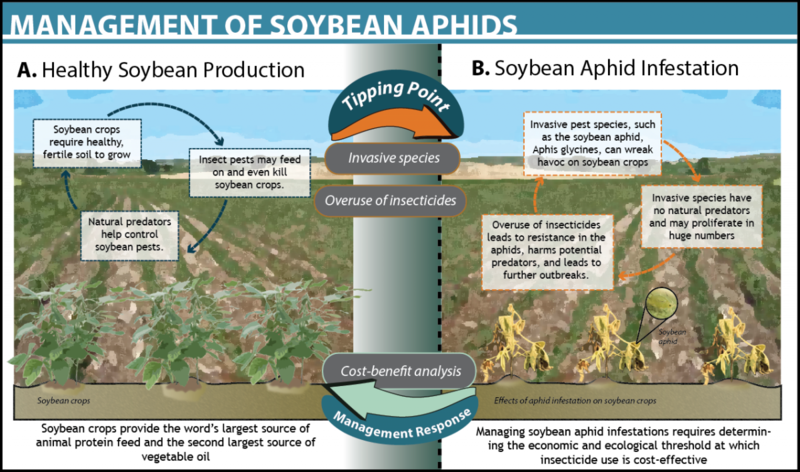 Economic models demonstrate that farmers should apply a pest control input when the market value of soybean yield lost to aphid herbivory, multiplied by the amount that value can be reduced by the pest control action, is greater than or equal to the unit cost of the pest control input. See Pedigo, L, Hutchins S, and Higley L. 1986. Economic Injury Levels in Theory and Practice. Annual Review of Entomology 31: 341-368. 5Daniel H. Cole, Law, Politics, and Cost-Benefit Analysis, 64 Ala. L. Rev. 55, 57 (2012). 6Kelly, R.P., A.L. Erickson, and L.A. Mease. In Press. Using Tipping Points to Improve Environmental Management. Ecology Law Quarterly. 7Kelly, R.P., A.L. Erickson, L. Mease, W. Battista, J.N. Kittinger, and R. Fujita (2014). Embracing thresholds for better environmental management. Philosophical Transactions of the Royal Society Biological Sciences 370, 1659.